Difference between revisions of "Schmidt, John P. (1938-2008)"
John Peter Schmidt: pastor and educator; born 12 February 1938 in Grande Prairie, Alberta to Peter John Schmidt (1906-1967) and Margaret (Unger) Schmidt (1910-1988). He was the fifth child in a family of 3 sons and 3 daughters. John grew up on a farm just outside of LaGlace, Alberta where he completed high school to grade 11. He was baptized on 24 July 1955 in Heiken’s Creek just south of the La Glace Mennonite Brethren (MB) Church. On 30 August 1958 John married Erna Voth in Coaldale, Alberta. Erna was the daughter of Isaac A. Voth (1901-1983) and Susie (Richert) Voth (1900-1986). They had three children, Darrel, Carolyn, and Milton. When John died at the age of 70 on 27 April 2008 in Langley, British Columbia, he had 8 grandchildren. John Schmidt’s father was instrumental in helping shape his son’s future ministry direction. His father sent him to Coaldale Bible School where he attended from 1954 to 1956. John then returned to Grande Prairie to work for a year before getting permission from his father to return to Coaldale so he could finish grade 12 and pursue his relationship with Erna Voth. They were officially engaged 27 June 1958 and married 30 August of that year. In the spring of 1960 John Schmidt felt the call of God to return to school to pursue some type of Christian service. 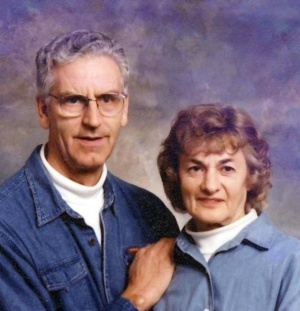 John and Erna moved to Winnipeg to attend Mennonite Brethren Bible College (now Canadian Mennonite University) where he received a degree in theology and then moved to Hillsboro, Kansas in 1963 to attend Tabor College where he earned his Bachelor of Arts. After graduation, John accepted the call to pastor the Harbor of Hope Chapel in Port Edward, British Columbia (1964-67). From there the Schmidt family moved to Fort St. John, British Columbia where John became pastor of North Peace MB Church (1967-77). John again felt the call to pursue studies and moved the family to Pasadena, California to attend Fuller Theological Seminary (1977-78) where he received an MA in Missiology. Following this, the family moved back to Grande Prairie where John became interim pastor at La Glace MB Church as well as taking his first teaching position at Peace River Bible Institute (1978-79). John’s third full-time pastoral position took the family to Ladner, British Columbia to start a new MB church which became Cedar Park Church (1979-83). During this time (1981­) John became vice-chairman of the British Columbia MB Conference and also worked closely with the provincial conference Board of Church Extension. In 1983 he was affirmed as a part-time BC MB conference minister, a position he held for three years. At the same time he was asked to pastor half time a new church in Vancouver called Faith Mennonite Brethren Church (1983-1985). He received an MDiv degree from Regent College in 1984 before beginning his doctoral studies at Fuller in 1985. He graduated with his DMin degree in 1991. His dissertation was focused on church growth and titled Pilgrims in Paradise: 60 Years of Growth in the MB Churches in British Columbia. It was during his part-time roles in 1983 that John’s passion began to turn from pastor to educator. He began some sessional teaching at Columbia Bible College (CBC) in Abbotsford, British Columbia before accepting a full-time position with the College (1985-2003). He was an instructor (1985-87), Academic Dean (1987-95), Internship Director (1994-2003), and Campus Pastor (1999-2003). John was instrumental in helping CBC become accredited with the Accrediting Association of Bible Colleges (AABC) during his role as Academic Dean. After retiring in 2003, John and Erna continued to drive out to CBC once a week, together to participate in prayer counseling. As well, they continued to be actively involved in the North Langley Community Church where they were charter members since 1987. Their ministry as a couple impacted hundreds of lives. Schmidt, Darrel. "Schmidt, John P. (1938-2008)." Global Anabaptist Mennonite Encyclopedia Online. April 2009. Web. 25 Apr 2019. http://gameo.org/index.php?title=Schmidt,_John_P._(1938-2008)&oldid=67973. Schmidt, Darrel. (April 2009). Schmidt, John P. (1938-2008). Global Anabaptist Mennonite Encyclopedia Online. Retrieved 25 April 2019, from http://gameo.org/index.php?title=Schmidt,_John_P._(1938-2008)&oldid=67973.